Shanikqa Canty is the author of a book entitled, Their Vow. She has now committed her life to empower others. Shanikqa intends to empower others through her writing and public speaking. It is always a pleasure to meet people who are motivated and determined to reach others through their gifts. And this is no different. Shanikqa has been a supporter of Lovely Miss Jones for quite some time, and shares similar goals of empowering others through writing and through experience. Below you’ll get to know a little more about this blossoming author, along with what you can expect in the near future. Miss Jones: Tell us a little about yourself? Shanikqa Canty: My name is Shanikqa N.Canty, I am 24 years old and I currently reside in Brooklyn, New York (In the Crown Heights Section). I am a Best Selling Author, Writer and a Promoter Of Empowerment. I have a passion for empowering and connecting authentically with those I come in contact with. MJ: Was becoming an author something that you’ve always desired to be, or was it something that just happened? SC: Becoming an author was something that honestly just happened (LOL). Like seriously, I didn’t even expect this to happen. And not just an Author, a Best Selling Author. God is just amazing! MJ: How long have you been writing? SC: I used to write when I was younger, in the 3rd and 4th grade, and I stopped; but in the Fall of 2014 the creativity of writing came back to me. MJ: What experiences led to where you currently are today? SC: Letting my past struggles empower me to create a life that I desire. I truly believe that each and everyone of us holds the power to create what we want. I let my testimony become my empowerment. MJ: What were some of your biggest struggles during this journey? SC: Some of my biggest struggles during this journey was keeping myself motivated and not letting fear and rule overtake me. But I’m grateful that I am on this journey of being more grounded in my Faith, that helps me overcome. MJ: What were some of your biggest highlights or positive movements during this journey? SC: My biggest highlights would have to be, connecting with some awesome and amazing Kingdom minded Men and Women. Just being able to fellowship and have a real support system. I wouldn’t trade it for anything in the world. MJ: Who are some of your biggest influences, and why? SC: Some of my biggest influences are: of course my mother because she supports me no matter what I pursue in life and just loves me as I am. My Spiritual Father Apostle Steven Newton, My Spiritual Mother Pastor Christian Newton, My Kingdom Sisters and Brothers, also Dr Myles Munroe & Steven Furtick (through their videos and books). Each and everyone of these individuals inspire me to be a GREATER woman that GOD has called me to be. MJ: What was the process while writing this book? SC: Writing “Their Vow” was fun and a little scary because I thought “Who wants to read a fiction book promoting celibacy”? But the feedback has been awesome. MJ: How were you able to overcome those things that came up against you? SC: Just remaining focused and keeping my eye on the prize. MJ: What/who kept you motivated? SC: Myself, and allowing the Holy Spirit to just move right through me. MJ: How long have you been working on this project? SC: Honestly I finished the book in 2 days, by typing it on my iPhone while at work. The words just flew right through me. MJ: Tell us a little about your book? SC: It’s the story of two individuals who decide that it’s better to keep Their Vow and not let the temptations of the world rule them anymore. MJ: What else are you currently working on? SC: At the moment just focusing on getting myself out there more, and my line of Tele-classes I’m about to launch. MJ: What are a few of your biggest accomplishments? SC: Just being able to share my gifts with the world. MJ: What can we look forward to in the future? SC: Live in person “Empowerment Sessions”, more books, videos and an empowerment product line. MJ: What encouraging words would you like to leave with us? SC: Your Testimony Is Your Empowerment, Because You’re Empowered By Your Struggles. Wise words from a wise woman. 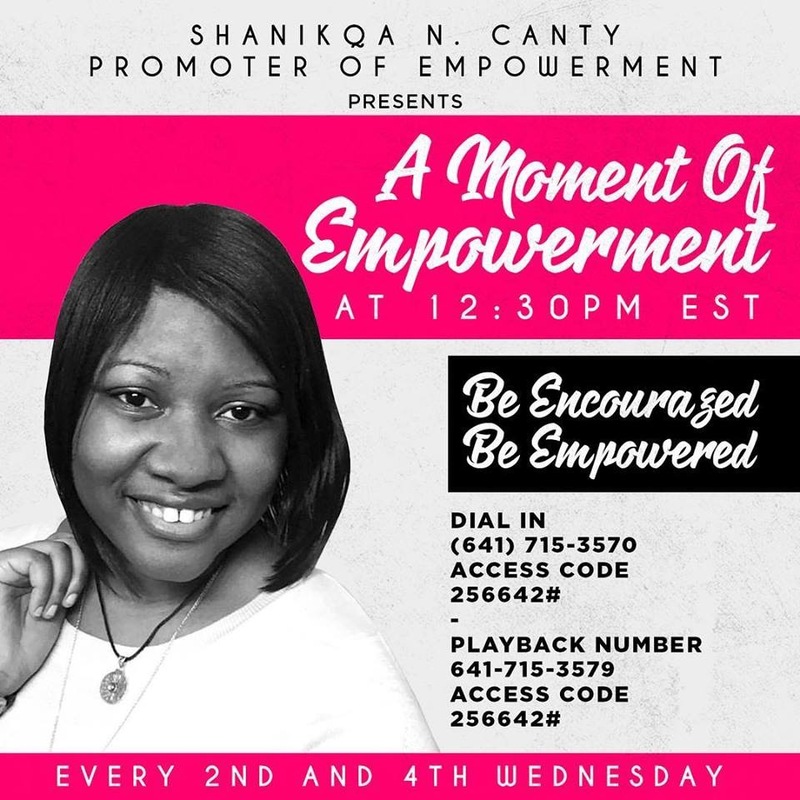 Not only is Shanikqa a bestselling author (her book can be purchased on Amazon.com), but she is also launching ‘A Movement Of Empowerment’ that will be held every second and fourth Wednesday via conference call. Check out the flyer below. Also, stay up to date by following all of Shanikqa Canty’s social media networks: Facebook.com/BeEmpoweredWithShanikqac and Instagram/Periscope @iamshanikqac.